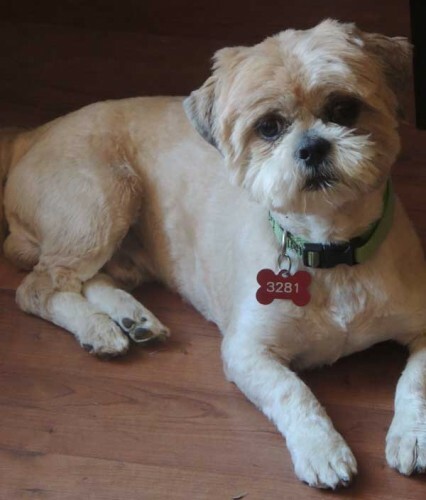 Shaggy is an approximately 3-year-old Shih Tzu that weighs 14 lbs. He is heartworm negative, current on vaccinations, scheduled for neuter next week, and will be microchipped before adoption. Shaggy was found by a Guardian Angel volunteer in his neighborhood running loose with a fishing stringer wrapped around his neck for a tie down. He was so matted that his hair had to be shaved almost all the way down. There was also a flea collar matted in his hair. Yet even with this rough beginning to life, Shaggy is a sweet and loving boy. He loves everyone he meets. His great with other dogs. He just needs that FOREVER home that will give him the love and attention he deserves.